Earlier today it was announced that Warner Bros. was rebooting Buffy The Vampire Slayer (the movie) without the consent or inclusion of creator Joss Whedon. 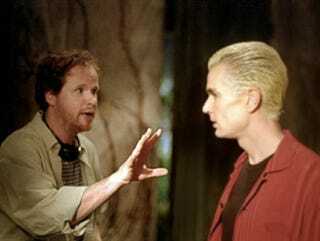 In response, Whedon sticks a witty stake in the remake, as only he can. This is a sad, sad reflection on our times, when people must feed off the carcasses of beloved stories from their youths-just because they can't think of an original idea of their own, like I did with my Avengers idea that I made up myself. I always hoped that Buffy would live on even after my death. But, you know, AFTER. I don't love the idea of my creation in other hands, but I'm also well aware that many more hands than mine went into making that show what it was. And there is no legal grounds for doing anything other than sighing audibly. I can't wish people who are passionate about my little myth ill. I can, however, take this time to announce that I'm making a Batman movie. Because there's a franchise that truly needs updating. So look for The Dark Knight Rises Way Earlier Than That Other One And Also More Cheaply And In Toronto, rebooting into a theater near you.